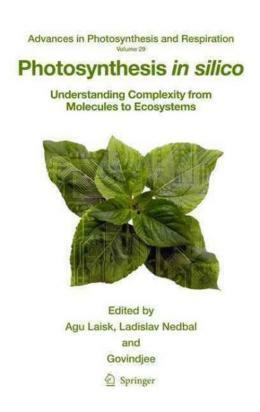 Photosynthesis in silico: Understanding Complexity from Molecules to Ecosystems is a unique book that aims to show an integrated approach to the understanding of photosynthesis processes. In this volume - using mathematical modeling - processes are described from the biophysics of the interaction of light with pigment systems to the mutual interaction of individual plants and other organisms in canopies and large ecosystems, up to the global ecosystem issues. Chapters are written by 44 international authorities from 15 countries. Mathematics is a powerful tool for quantitative analysis. Properly programmed, contemporary computers are able to mimic complicated processes in living cells, leaves, canopies and ecosystems. These simulations - mathematical models - help us predict the photosynthetic responses of modeled systems under various combinations of environmental conditions, potentially occurring in nature, e.g., the responses of plant canopies to globally increasing temperature and atmospheric CO2 concentration. Tremendous analytical power is needed to understand nature´s infinite complexity at every level.